Posted in: Building Aid, Store information. Well in time for summer I release these two hat generators. 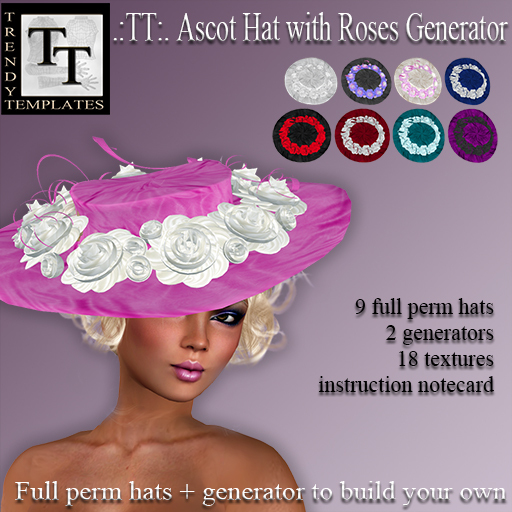 They each come with 9 full perm hats, lots of textures and of course the instructions on a notecard. 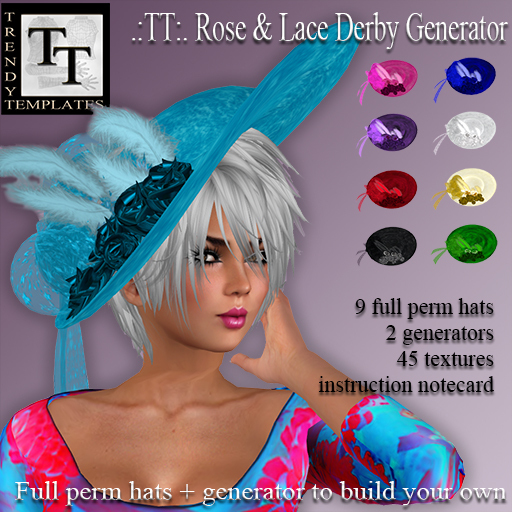 Knock yourself out in completing your summer outfits with these elegant hats with roses, lace and feathers. In the breath, I will announce my sabbatical. It turns out that moving is wearing me out. The current move – the forth one in three years and hopefully the last one – is the ultimate challenge. Stuff from Holland, stuff from the apartment of my parents in law, stuff from the rented apartment we had in Portugal, it all has to be brought together into our new home. At the same time, I try to make friends, plant our roof terrace with pots full of flowers, learn a new language and enjoy the new adventures. For Trendy Templates this means that there will be no Generator Month this year. I will be online once a day to solve problems, but I won’t be working on new stuff for a while. Perhaps when the winter kicks in and the dust has settled around us, I will find the time and peace of mind to sit behind the keyboard more. For now, I wish you all a very happy Easter and a glorious summer. New designer on the top floor. Unfortunately, Lyrical Bizar had to close her satellite stores and we had to let her go after renting a boutique for the past four years. 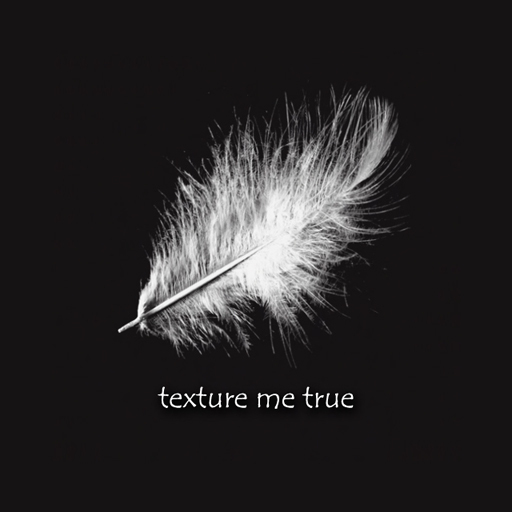 This week we welcome Oumi (Ouminakati Aboubakar), the creative force behind Max Textures Design (MTD). She filled her boutique with fashion accessories. Her hats and shoes are to die for. Don’t hesitate to take a look and take advantage of the limited promo sale of 30% discount on her shoes!!!! 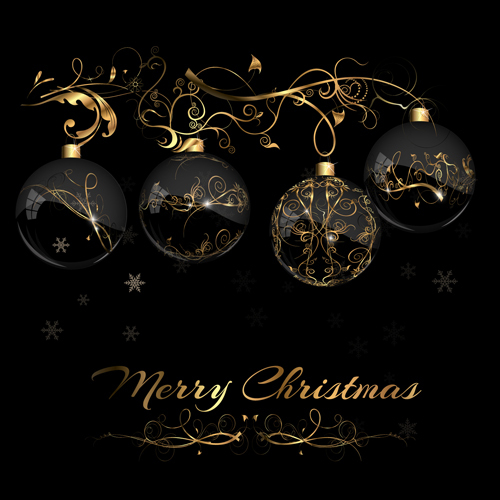 I wish you all a wonderful Christmas and a new year full of health, happiness and lots of inspiration! Just in time for a quick sassy Christmas Dress I took the Halloween She Devil Template and cut it up in parts. Earlier this year I already released the Special Model K Skirt generator that was used in this template. Today I do the same with the sleeves (Basic Model 10), the collar (.:TT:. 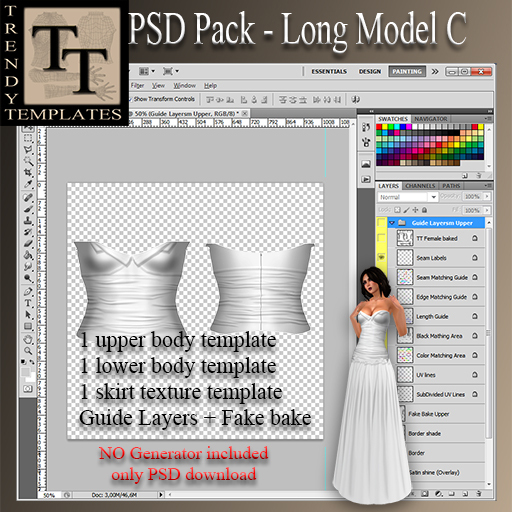 High Collar) and the PSD pack (PSD Pack Special K & basic 10). This was a special request of one of my customers this week. She told me she loves the Slender Winterdress, but she already has the Skirt Generator (Long Model C) which indeed was one of my first models. She asked me if it would be possible to just buy the template, like a PSD pack. What a marvelous idea. I will start making many of my templates available as PSD pack. No textures, No generators but only the PSD files to download and use in your own designs. The first one to be made was of course this Long Model C / Slender Winterdress Template. The demos for all the PSD packs will be available now in the Skirt and Ruffle Generator Demo console, so please rez your old one and click for the updated version. Check out the PSD pack on the marketplace or get your 5% discount in the Store. Perhaps you have been thinking of creating a fluffy Christmas outfit, an angel costume or a winter bride. In any case, you could have use of this soft, fluffy and furry hat. And the best part is, it is completely for free! A fully functional generator to make your own hat with your name as the creator of it. It matches perfectly with the Fur Bolero or wedding outfits. All you need to do to get this gorgeous hat is wear your old TT Teleport HUD and a new version will be presented. When double clicked to wear, it will present you this new December gift. If you still don’t have a Teleporter HUD, be sure to get one in the store or from the marketplace. It has handy links to all bestseller stores, to the website, the designer portal and the (free to use) photo studio with over 400 different poses, different backgrounds etc. etc. Gifts from the teleporter HUD, neither this one nor older ones, are not available for sale. Normal EULA rules apply for the gifts as well. 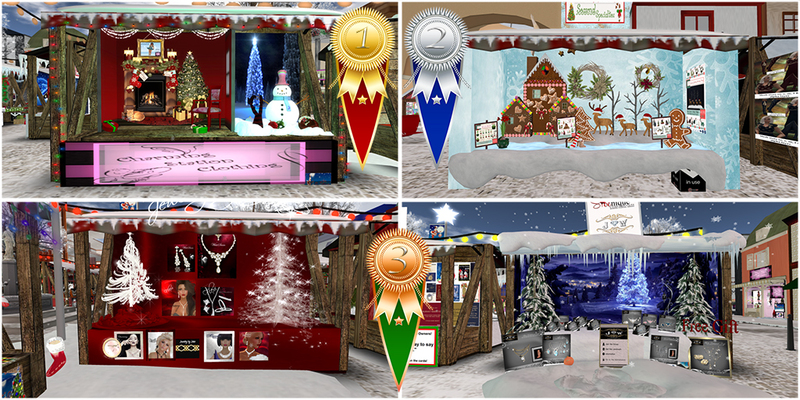 Mr and Mrs Claus have been visiting the Christmas Market and casted their votes on the best-looking booths. Let me start by passing their compliments on ALL market stalls. “My wife’s favorite market has never looked as good as this year”, Santa said. After he and his wife have been strolling both squares for over an hour he started making a list with the winning booths. It seemed to me he and Mrs Claus couldn’t get to an agreement. So after some quarreling and deep sighs he gave me a list with no less than 8 winning booths on it. The first prize goes to Gidget Hollow of Charming Station Clothing. She will receive a 500 L$ Store Card from Trendy Templates, 5 Texture Packs of winner’s choice from Texture Me True and a full perm jewelry set Delicious Necklace & Earrings from Lyrical B!zarre. The second prize goes to Shelby Olivier of Simply Shelby. 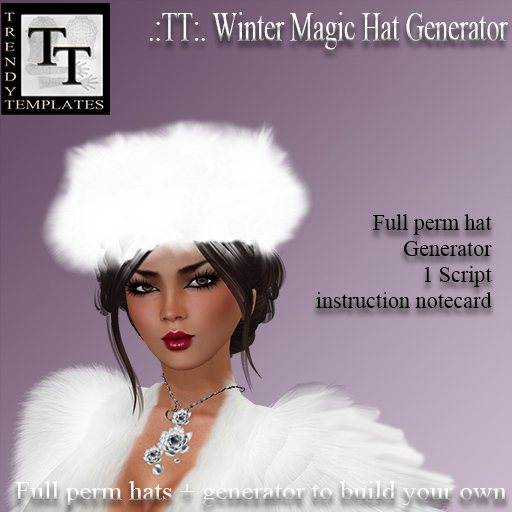 She will receive a 300 L$ Store Card from Trendy Templates, 3 Texture Packs of winner’s choice from Texture Me True and a full perm jewelry set Delicious Necklace from Lyrical B!zarre. The third place is shared by Tjake Kearny of Jewelry by Jake and Wenadriana Soderstrom of Shoenique and J&W Jewelers. 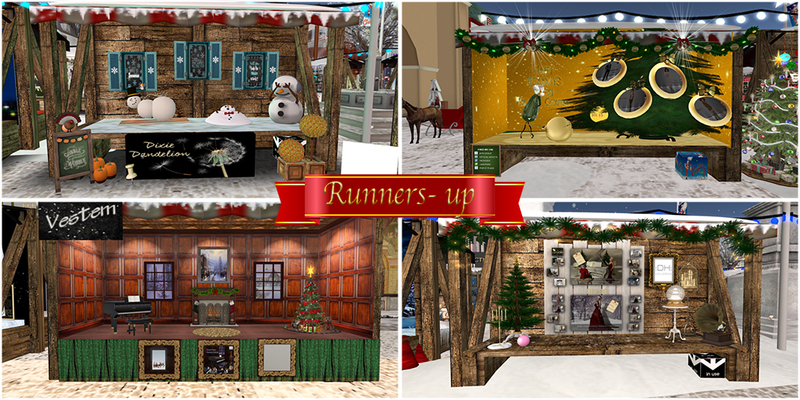 They both will receive a 200 L$ Store Card from Trendy Templates, 2 Texture Packs of winner’s choice from Texture Me True and a full perm jewelry set Delicious Earrings from Lyrical B!zarre. They all will receive a 100 L$ Store Card from Trendy Templates and 1 Texture Packs of winner’s choice from Texture Me True. Mr and Mrs Claus thank all the contestants for their effort to make this fair look the best in Second Life and they invite everyone to have a look. “Ooh, and don’t forget the Advent Hunt will start on December 1”, Mrs Claus said just before she hopped next to her husband in the sleigh and slipped into the dark night on her way to packing more presents.